The following are some sources for water, and a few notes for each. Most everyone relies on this resource and distribution network. Requires operating infrastructure, maintenance, treatment supplies. Requires large pumps and electricity. Generator backup power will keep it flowing for awhile after power outage. Pipeline contamination possibility with major disasters. Know where your town’s water source is located (storage tanks and source). You are dependent on this system for survival (unless with backup plan). Electricity could be from alternative methods (solar, battery bank, etc). Manual pump could be a solution, and advisable as backup. Rope and bucket, depending on well diameter. Cost of drilling and implementation. Water pumped up to storage vessel containment. Gravity feed from storage vessel for emergency (store higher than user location). Filtration / treatment for drinking, depending on source quality. Good overall self-reliant method (with appropriate backups for power, pump). Transportation of water to intended location. Buckets, pails, lids, water jugs. Manual transportation, wagon, 2-wheel dolly, hand-truck, bicycle/trailer/saddlebags. Vehicle transportation if fuel is available. System of pipes with pump, if nearby to location. Gravity system may work, if applicable. Storage in vessels at intended location. Water will need filtration and purification for drinking. Best resource if you’re lucky enough to have one. Constant source of positive water flow. Still requires transport or pump to dwelling. Temporary water source after rainfall. Water from runoff in low lying areas. Filtration and purification definitely needed for drinking. However long standing untreated pool water will be devoid of chlorine. Know who has pools in your location. Use Google Earth to find them. Emergency water location that many will overlook. 40 to 50 gallons commonly available in home hot water tanks. Safe to drink unless sitting unused for a long time. Use a length of hose to adapt to drain spigot to a bucket. Emergency location (not the bowl, but the tank). Several gallons of water available in holding tank. Purification if used for drinking. Easy storage of manageable sizes. Good size for hiking or bugout with backpack. Purpose built water storage vessels. 5-gallons up to 55-gallon drums (or larger). Food-grade, designed for water storage. Common recommendations of 1 to 3 gallons per person, per day. Keep storage out of sun and heat. Drainage and water runoff areas. Filtration needed for drinking depending on method of collection. In most cases, water should be filtered first to remove sediment or cloudiness. Some water filters are good enough to remove much, most, or even all pathogens, which may eliminate the need to further purify the water for drinking. Be aware that the ‘water still’ method is the only method on this list that will separate ‘pure water’ from chemical toxins which may be present in the water (know your water source). Purifies any water (including salt water) into pure water. Water is boiled to steam. Routed through tubing, steam condensed back to water. Copper tubing is commonly used. Method of boiling required, and fuel source. ‘Still’ needs assembly and adaptation to boiler. Many online ‘how-to’ plans available. Probably the safest, non-chemical purification method (along with the Water Still). Once the water reaches a rolling boil (212° F, 100° C), it has become safe to drink. or 160° F (70° C) for 30 minutes. or 185° F (85° C) for several minutes. Save fuel, don’t boil longer than necessary. Regular unscented bleach, hypochlorite (concentration 5.25 – 6 percent). Newer bleach is now 8 percent (okay to use). 8 drops per gallon (1/8 teaspoon). 16 drops per gallon for cloudy water. Liquid Bleach loses its potency over time. Half strength in one year. Caution: Corrosive to metals. Do not breathe in. To make a stock of chlorine solution (do not drink this!) dissolve 1 heaping teaspoon (about one-quarter of an ounce) of high-test (78%) granular calcium hypochlorite for each two gallons (eight liters) of water. To disinfect water add one part of the chlorine solution to 100 parts water to be treated. Disclaimer: Do your won research for conclusions before using Calcium Hypochlorite. Quick simple method for hikers. Advisable not to use this method for more than a few days in a row. Do your due-diligence regarding choosing methods of water purification. Clear plastic water bottle, 2 liters or less. Direct sunlight for 6 hours (clear water). Several days if the sun is clouded. UV-pen and other portable UV methods – require batteries. 1 or 2 tablets per quart. Requires a head of pressure in the supply line. Capacities from one to several gallons. Quality filter will last a very long time. I read a comment on another blog from a guy whose well pump died and he thought he could get water out of his water heater. Turns out the water heater had such a buildup of sediment that no water would come out the drain tap. Lesson learned: regular maintenance and draining of sediments out of your water heater is a must if you want to count that water as usable without tearing apart your water heater. Agree that regular maintenance is a great idea. You could use a siphon to get the water out of either the hot or cold connections to the heater. Usually pretty easy to disconnect. Don’t forget to replace the anode every five years or so. Not an easy job. I live about a half mile from a river that is always flowing. But I’ve never learned to ride a bicycle and don’t have a cart or dolly. It occurred to me that I might be able to load 2 or 3 gallon jugs of water in my suitcase. It is large and on wheels. I have looked into buying a cart or tricycle, but those are expensive and some reviews (Amazon, etc.) say they are flimsy. Daisy…. I bought a cart on Amazon, but before I did that, my plan was to confiscate a grocery cart. I did google it to make sure I knew what you were talking about. I bought my water heater used (didn’t have enough money for new) and it already has one of those valves on it (the kind with a lever handle). I use it to drain out the sediments every couple months because I’m on well water that has a lot of calcium in it, which turns to a rock hard crust if you leave it. I think you’re talking about the pressure relief valve. Usually towards the top of the unit. The drain valve is always towards the bottom. Have a Berkey filtration system (in reserve) – lakes and streams within 2 -3 miles – have heavy-duty wagon and wheel barrow. 40 gallon rain barrel, and about 25 gals fresh in storage. Love the tip about locating nearby pools. Not for pilfering, but for barter (or if they’ve abandoned their residence in SHTF time). Add Tang, instant tea, instant coffee, fruit mixes to camouflage the filtered taste if any. I have a canvas bag that holds 2 teaspoons, (2) 2 liter bottles, 2 gallon jugs, and my CH bags still in the packages bought in. JayJay – I looked at the label on the liquid chlorine I use in my pool, and the ingredients are identical to what’s in my laundry Clorox bottle, Sodium Hypochlorite, except the concentration is double, but cost is only about the same ($3.50/gal.) Shouldn’t that also be useable for drinking water? NO!!! Calcium hypochlorite, NOT sodium hypochlorite. Oh, yes, your pool shock is what I have, and it IS calcium hypochlorite–I misread the post. Yep–your old trustworthy pool shock is what will clean and purify your water for you. Of course, I have iodine and a Berkey. Dave, it’s the storing for long term versus short term for me. The bleach has a 5 month shelf life and requires lots of space; the pool shock has an indefinite shelf life if kept in the paper bag in a cool, dry place (and mine is)and takes little space. We have 3 different sources of water that we can see from our kitchen windows. A pond, a brook, and a spring. Plus we are on well water with a generator to run it. A rain barrel, and roughly 5o gallons of stored water. We have two different filter systems one being the big Berkey, and yet I still worry about water. Maybe I’m just obsessed. Most folks don’t think of using Google Earth to find ponds and lakes. I found a huge/little lake/pond across the street behind the barns and canvas tents of a man that sells produce. I had no idea and I go there to buy stuff!!! I have (20) 30 gallon drums in the garage and will use each as rain catchers when empty. Every gallon jug emptied here gets filled even if it’s bleach and cleaners–that water can be used for something. What was the prior use of those drums? Chemicals always leave a residue no matter how well you think you cleaned, so be careful. I found a website that addresses water supply. http://www.drillyourownwell.com After reading through & watching the videos I think its a no-brainer to drill a shallow well in a lot of areas. Even though a lot of deep aquifers are mapped & a good source, pre-municipal Americans did dig shallow wells. They worked. As far as purifying water, boiling is a viable short term solution, but very energy & labor intensive long term. I think it would be pretty easy to crush up charcoal & setup a filtration system. Obviously activated charcoal is best, but even ground briquettes contain carbon which is what absorbs the impurities. The more surface area exposed to the fluid the better. Downstream from that setup a UV bath. Either a purpose built unit or a homemade shallow pan with a glass cover. MAKE sure you use glass that is UV transparent. A lot of glass isn’t. Put some colored cloth under it and if its UV transparent it will bleach the cloth. Or set it over grass & see if the grass grows or dies. There’s two types of UV, I believe the UV A is what kills pathogens. I do not know if UV will kill all pathogens… But dehydration WILL kill you. Just my 2 cents. I used Google Earth to locate natural water sources near my current home, and I was pretty surprised to have found as many as I did including pools at nearby residences. Google Earth is so valuable… I used it to scout out my next living locations, my bug out locations, and a whole lot more. A few years back I realized just how bad things can get super quick without clean water, and to this day and ever after I save every plastic bottle I get for water storage purposes. I also keep 10 55 Gallon drums filled with water and I still don’t feel like it’s nearly enough. People take water and clean water totally for granted and that is easily one the very worst of mistakes there are. Try going two days without any water at all and you will see just how miserable and dysfunctional you and everything else gets, and then, try getting it without a sink or store or whatever modern convenience, and you will definitely see and feel just how valuable it is. also condensation water , such as from a dehumidifier. the water is distilled, so i guess it is OK to consume without treatment. I don’t think a dehumidifier “distills” water, or purifies it. I have had water right from a water distiller, and emptied many containers from a dehumidifier, and the two do not smell the same to me. I’ve a 600′ water well, w/ 220v pump. I suppose I’d lose my pump? If so, what’s my backup? I could buy (presently) a new/replacement pump & connections, store in Ferraday cage. A hand pump isn’t viable. 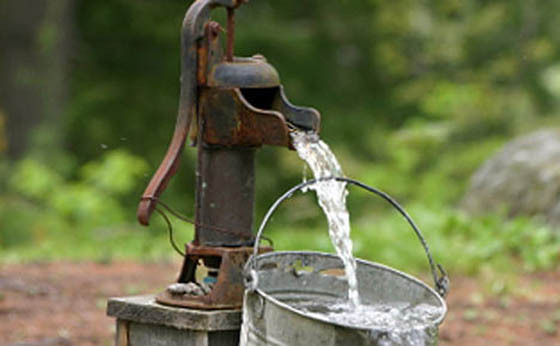 back on the farm (many yrs ago), we had a pump well, and pumped by hand. no need of electricity. maybe it was shallower.